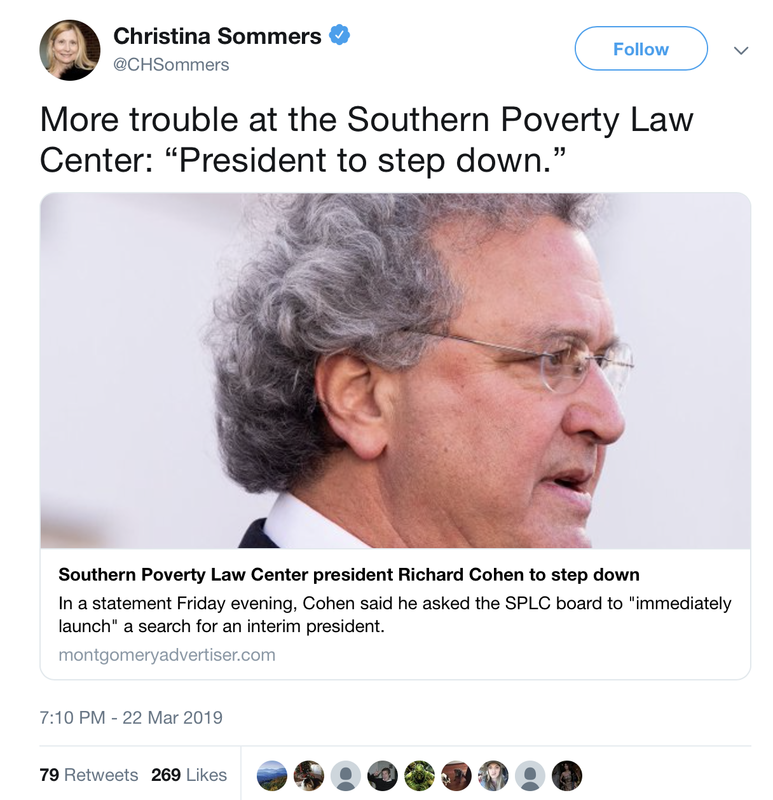 Steven Pinker fanboy Jerry Coyne wonders whether the Southern Poverty Law Center is going to die. The SPLC has not been shy about criticizing members of the IDW - Coyne mentions two of them in his piece, Maajid Nawaz and Ayaan Hirsi Ali, married to rightwing political operative and sometime economist Niall Ferguson. SPLC has also made unflattering mentions of other IDWers including Sam Harris, Christina Hoff Sommers, Stefan Molyneux, Ben Shapiro, Jordan Peterson, Milo Yiannopoulos - in fact it looks like Steven Pinker might be the only IDW who isn't mentioned in a negative way by the SPLC. So of course the IDW bitterly hates this venerable organization devoted to fighting racism and sexism. Coyne cites a recent New Yorker article about SPLC which details its organizational dysfunctions. Having worked for a variety of organizations over my career, from huge corporations to tiny start-ups to non-profits to government agencies to food co-ops, it doesn't sound all that remarkably bad. It's an organization run by fallible human beings. An organization that is currently cleaning house, which is exactly what it should do. Then he quotes from the New Yorker piece. It's hypocritical that he should be so concerned about racism and sexism at the Southern Poverty Law Center when Quillette, which he has praised and which Pinker has written for, is devoted to racism and sexism - carefully couched as science, of course. Utterly crappy science, but the right-wingers who look to Quillette as a shining beacon for their beliefs aren't too picky about the science - it's good enough for them that someone is comforting them: oh no, you and James Damore and Bo Winegard aren't racists and sexists! You're just pro-science! Quillette's author line-up has long been a sausage party, and looking at every byline currently listed on Quillette today, it still is. 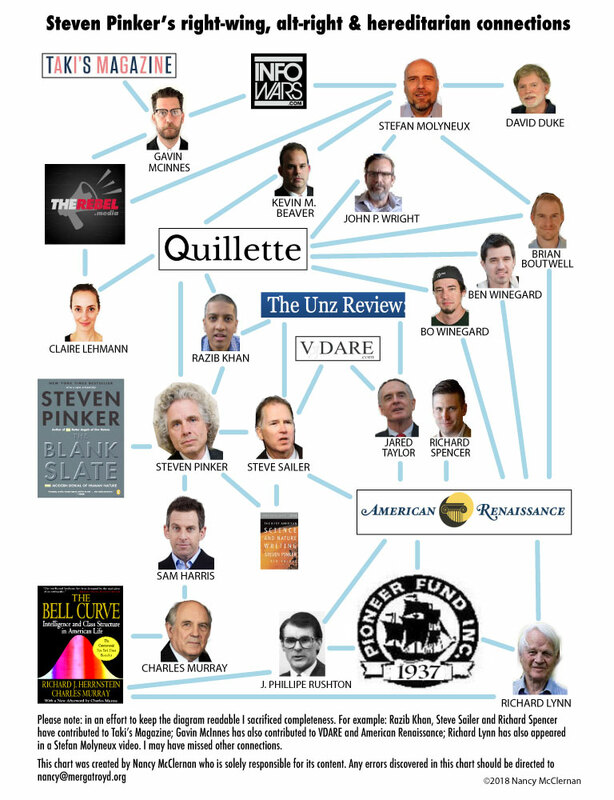 I count 31 names of which 6 are women, one of them is Quillette's founder. Don't hold your breath waiting for Jerry Coyne to complain about that. A major problem with SPLC, it appears to me, is that it's been run for too long by aging white men with 20th-century mindsets. Much like the New Atheists where Sam Harris, at age 51 is the spring chicken. Meanwhile Donald Trump is aligning with the IDW. There's even an article in the New Yorker about it and Quillette is celebrating it but for some reason it has avoided Coyne's notice.